Team Jefferson Starship reviewed this attraction on September 24, 2016. 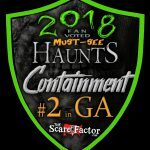 Containment Haunted House is a relative new-comer to the north-west Georgia area, however nearly all of the staff have a strong background in haunted attractions and that prior experience shows. If you need to get locked in to a haunt this year, be sure to visit Containment for an interactive experience. We were able to get in on an early, private opening for friends, family and the press, so the crowds on the night that we went were not as heavy as on a normal season evening. The cast of Containment are perhaps the first and most important reason you should be visiting this haunt. From the line-keeper who lets you in, to the deep voiced creep in the first room, to the escaped psycho “Ethan,” to the night-club bouncer, to the room full of interactive dolls – as a whole, the cast was good at engaging visitors with dialogue and banter. There are a few masks in Containment, but costumes tended to be believable and appropriate for each of the various scenes involved. Makeup was slightly inconsistent across the attraction in that some actors had very good, believable makeup but others had makeup that looked rushed and was distracting. 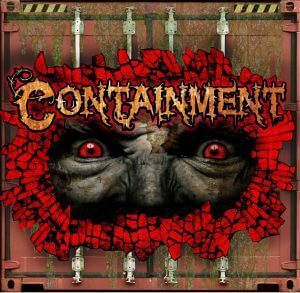 Containment is built out of, around, and through a series of large cargo containers. Because of this, there are several small ramps that lead into and out of some scenes. We felt that some of these ramps could have been better lit or labeled as they caused a few small stumbles during our visit. While the signage for the Haunt itself is noticeable, the location can be a bit hard to find – it’s in the lot adjacent to a paintball arena. Because of this, parking was a little confusing… but manageable. Be alert and aware while driving into the site. Queue entertainment was provided by Choo-choo the Clown; basically your usual creepy clown, Choo-choo was good with eerie stares and witty banter. He was entertaining, but didn’t entirely fit the feel for the haunt. The waiting area for the line added to a claustrophobic feel; on a busy night, it would be a rough wait. Staff is friendly and responsive, even answering phones on a night such as the one we visited, unlike many other haunts. From the outside, you get a good view of the container vessels that the haunt is built from and it seems as if the haunt is going to have a zombie outbreak theme. This preconception is one of the reasons that Choo-Choo the clown was such a distraction. Since the main entrance to the parking lot points at a paintball attraction, nothing really screamed haunt. While waiting in line, however, you could occasionally hear bits of sound effects, including resounding bangs, panicked screams, and startled shouts. Some of the sounds effects and music in Containment were louder than they needed to be, but all of them were realistic and appropriate. Detailing was well done and we appreciated the inclusion of scents and temperature control into the repertoire of effects. Like the sounds, the lighting was inconsistent. Placement of lights could have been done better; moving a strobe behind the path visitors walk on instead of shining directly into their faces, for example. There were a number of props that were good, and some effects that we have not seen before that were very well done – a fridge full of body parts and an articulated mannequin in particular stood out as highlights. As stated previously, given the appearance of the site, the zombie response team vehicle out front, and the name of the attraction, we initially (and mistakenly) believed that the haunt was going to be have a zombie outbreak premise. 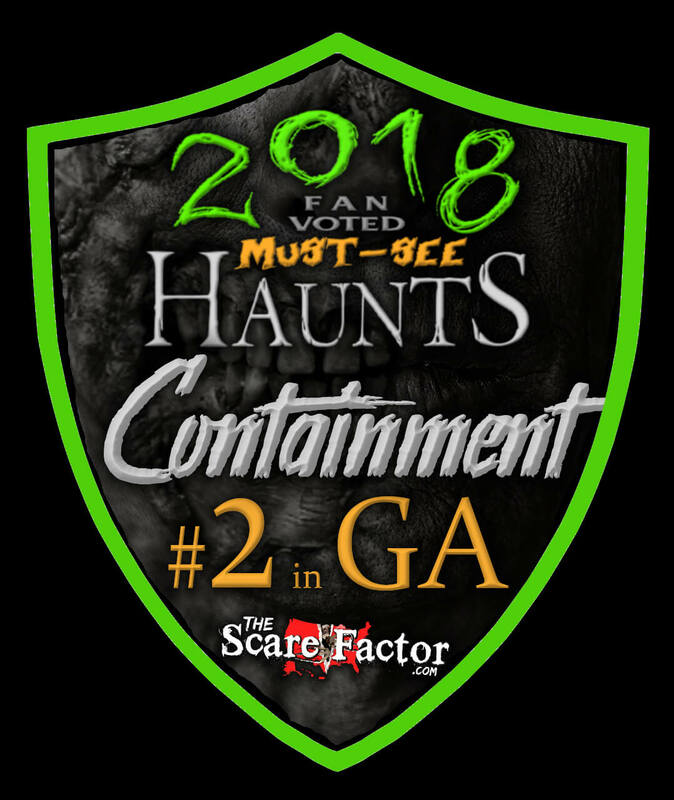 However, Containment has no particular theme, instead leading visitors through a variety of different locations, scenes, and small contained themes more akin to a traditional, old school haunt. Each singularly-contained scene was well done, however. Containment featured a lot of personal interaction which, of course, means that actors are best able to play upon the fears and unease of specific visitors – this is a skill and draw that cannot be ignored. There were also a lot of static props and scares that triggered at different points giving everyone in the group an opportunity to experience a variety of things. Scares were fairly predictable across the haunt. We went through in a small group of four, but we think that groups as large as six went through before us. Given the size and lay-out of some of the ‘rooms’ in the haunt, we’re not certain that larger groups are going to be as scared given the space available to accommodate both visitors and actors. We were able to get through Containment in about 30-45 minutes. Given the nature of the haunt, this seems to be about average. General admission tickets are $25 and fast pass is $35. On a busy night, it is not uncommon to face an hour-long wait to enter the haunt. But, with the personal attention from actors and the time taken to traverse certain scenes, that kind of wait is to be expected, although some visitors may balk at such a length of time.